Don’t have time for breakfast? That’s rubbish! This recipe couldn’t be any easier, and so that means no excuses buddy! Breakfast is so important, and not just for weight management, but also for your brain. Seriously how can you expect your body to get up and go if you haven’t fed it anything good? This recipe won’t score high on a the pretty scale, but it will absolutely pass the taste test, and it will definitely keep you full until lunch: I promise! Did I also mention that it’s vegan? The photo above was taken before I smashed in the bananas and before put the whole mixture in the fridge to leave it overnight. I decided not to take a photo of what it looked like in the morning because I don’t want to ruin the surprise for you! I put mine in a jar, so I could tote my oats with me to work to enjoy at my desk. I go to work super early and I definitely do not have time to eat before I leave. Recently I’ve been thinking about switching up my breakfast routine. Don’t get me wrong I love my cinnamon mango smoothie, but I was just feeling a little bored with having the same thing for breakfast for over a year. So I searched the interwebs and stumbled on this recipe, and figured I’d give it a go! Sometimes it pays off to be optimistic, and sometimes not! This was one of those times when it worked out, and in a big way!! I’m not going to lie I was little weary about trying (a) vegan oatmeal and (b) oatmeal that’s not been cooked. I decided to share my no-cook-oatmeal-adventure on my personal Facebook, and I have to stay it caused quite a stir. You know that old saying “don’t judge a book by its cover” well that’s the same mentality you’ll need to apply to this recipe. It looks terrible, but it’s flavor makes up for all that: ten fold! The original recipe called for vanilla, but I just ran out, and I’ve been meaning to replace it, but I figured some pure maple syrup should do the trick. Then I thought well maple syrup is amazing with cinnamon, so I’ll throw that in there too! The result? perfection! I’m so happy with how this turned out that I made it again the second day. Be careful if you don’t eat a lot of chia seeds because it will make you feel sort of bloated, but the more you eat them the less this will occur. Add sliced banana and smash it up into the mixture as much as possible. This will ensure the flavor is throughout. but it will also create a pudding/yogurt like consistency! Feel free to add some fresh berries or apple slices in the morning! I didn’t bother, and the oatmeal was fine on it’s own! 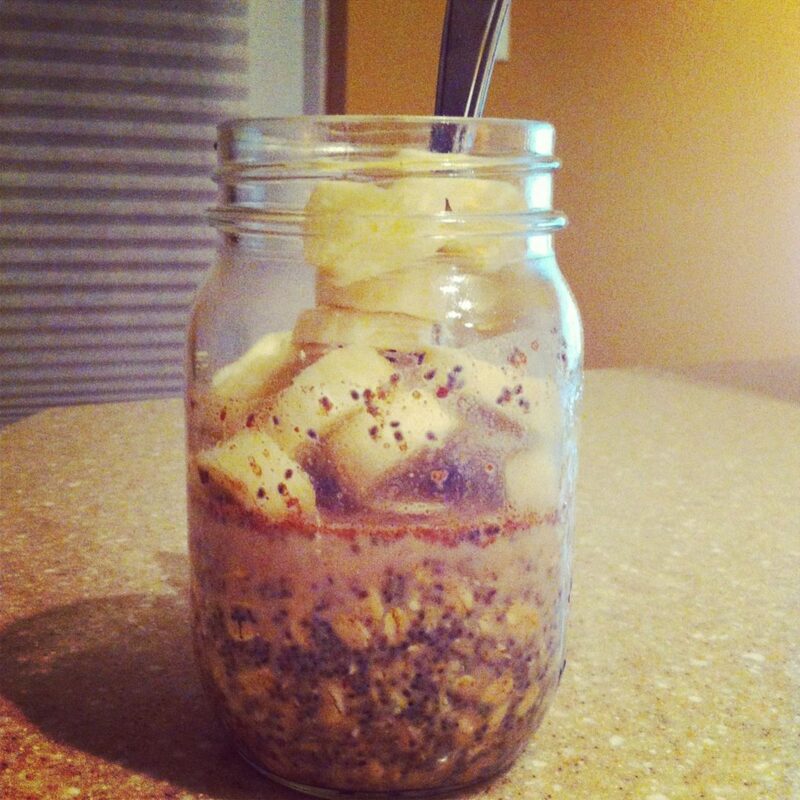 What do you think blog reader would you give these vegan no cook overnight oats a go?